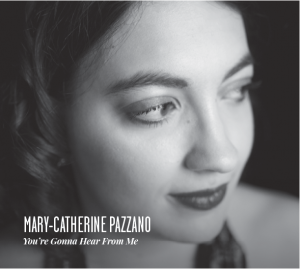 Meaford Independent, Bill Monahan, June 13, 2018 "A rising star known for her interpretations of jazz standards, Mary-Catherine will be performing [from her]... debut album, You’re Gonna Hear From Me, released last year and winning international accolades." Waterloo Chronicle, November 27, 2017 "At this special Jazz Room presentation, the smooth and theatrical voices of Joni NehRita, Mary-Catherine Pazzano and Derek Hines will be featured in this repeat performance by two of the region’s finest ensembles." cfmu.ca, November 17, 2017 "You're Gonna Hear From Me" charts on CFMU Radio on November 17, 2017. Muzooka Radio, November 8, 2017 "You're Gonna Hear From Me" charts on Muzooka Radio for the week of November 8, 2017.